Inclusive green growth offers a route out of multiple related crises - in the economy, the environment and society. Yet for green growth to really fulfil its promise, it needs to be truly inclusive - tackling issues such as poverty, inequality and the exclusions that constrain both growth and environmental sustainability. Without this broader support, stand-alone green growth projects and investments will not lead to real transformation. A new report from the Global Green Growth Institute (GGGI), the International Institute for Environment and Development (IIED), and the Green Economy Coalition (GEC), "Pro-poor, Inclusive Green Growth: Experience and a New Agenda", addresses the explicit linkages between a pro-poor and inclusive approach in driving green growth. 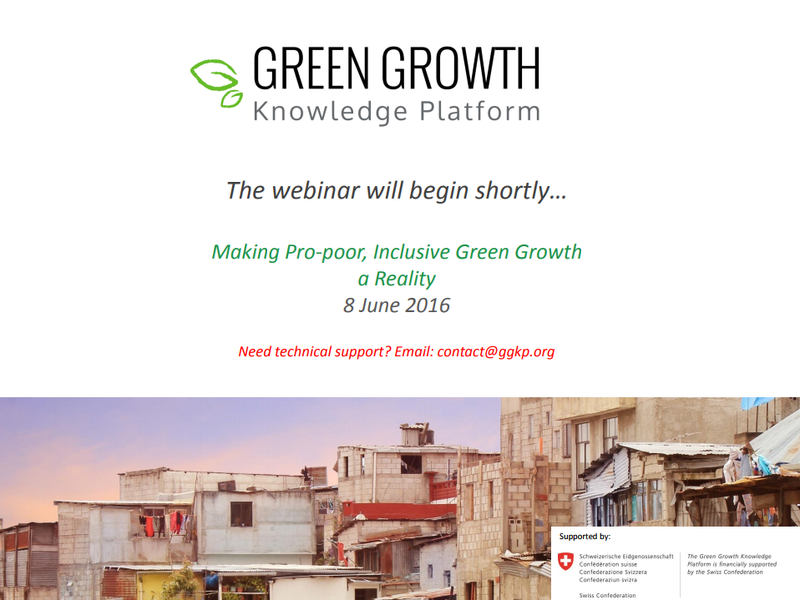 On 8 June 2016 (10:00 AM CEST), the GGKP, together with the organisations behind this report, held a webinar which highlighted key conclusions and policy recommendations from the report, and outcomes needed to achieve an inclusive green growth transformation, namely: i) integrated governance; ii) empowerment of marginalised groups; iii) accessible finance; and iv) metrics. This webinar was held in the run-up to GGGI's Global Green Growth Week and the Fourth GGKP Annual Conference on the theme of 'Transforming Development through Inclusive Green Growth'. At the top of this webinar, Orestes Anastasia, Principle Knowledge Manager at GGGI, provided an overview of the conference preparations, registration details and opportunities to engage.